The first unit of the regular Free State Army take over Beggars Bush Barracks. ‘least we ever forget these men’. The National Army was constituted from the revolutionary Irish Republican Army (IRA) (previous the Volunteers founded in 1914 by Eoin MacNeill), which emerged from the successful Irish War of Independence fought as a guerrilla campaign against the British Army and Royal Irish Constabulary. 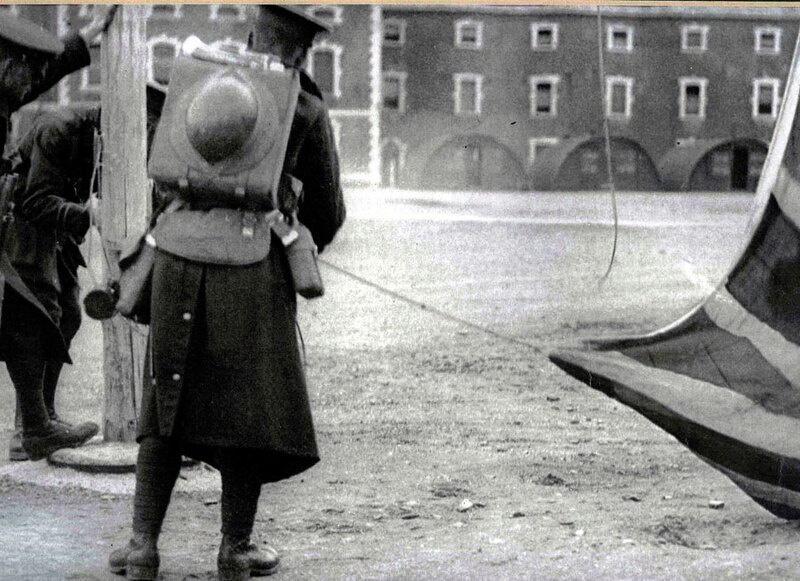 On 31 January 1922 the first unit of the new National Army, a former IRA unit of the Dublin Guard, took possession of Beggars Bush Barracks, the first British barracks to be handed to the new State. Michael Collins envisaged the new army being built around the pre-existing Irish Republican Army, but over half of this organisation rejected the compromises made in the Anglo-Irish Treaty, and favoured upholding the revolutionary Irish Republic that had existed from 1919 until 1921. In February 1922, the new Provisional Government began to recruit volunteers into the National Army. A force of 4,000 troops was envisaged, but with the impending Civil War, on 5 July 1922 the Provisional Government authorised an establishment of 35,000 men; by May 1923 this had grown to 53,000 troops. The National Army lacked the expertise necessary to train a force of that size, so that approximately 20 percent of its officers and 50 percent of its soldiers were Irish ex-servicemen of the British Army. These afforded considerable combat experience to the Army. In March 1922 there was a major stand-off between up to 700 National Army and anti-treaty IRA in Limerick over who would occupy the military barracks being vacated by departing British troops. The situation was temporarily resolved in April when the two sides agreed to occupy two barracks each. In April 1922 General Adamson, a National Army soldier, was shot dead by the IRA in Athlone. In early May 1922 there was an even more serious clash in Kilkenny when the IRA occupied the centre of the town and 200 National Army troops were sent from Dublin to disperse them. 18 people were killed in the fighting in Kilkenny. In a bid to avoid an all-out civil war, both sides agreed to a truce on 3 May 1922. The British supplied artillery, aircraft, armoured cars, machine guns, small arms and ammunition to the National Army. Michael Collins, Richard Mulcahy and Eoin O’Duffy planned a nationwide offensive, sending columns overland to take Limerick and Waterford and seaborne forces to Counties Cork, Kerry and Mayo. The only true conventional battle during the offensive was the Battle of Killmallock. Collins was killed in an ambush by IRA forces at Béal na mBláth in County Cork on 22 August 1922; General Richard Mulcahy then took command. 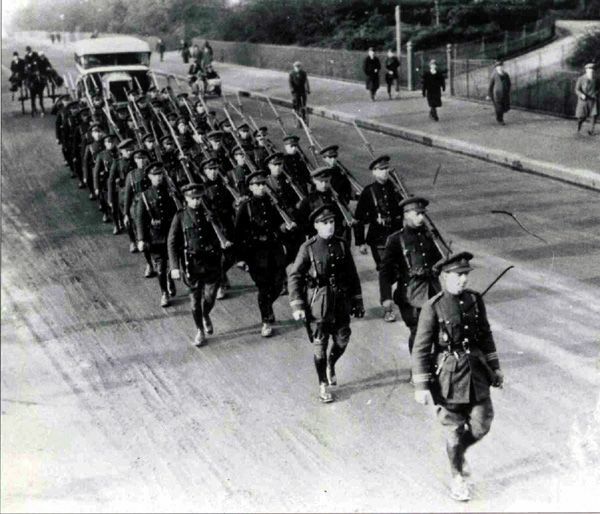 Some of the National Army’s most effective troops were the Dublin Guard, who were to the forefront of the Free state offensive in the summer of 1922. The Guard was formed in June 1921 by an amalgamation of the IRA Squad and Dublin IRA Active Service Unit – both pro-Treaty in sympathy due to their links with Michael Collins. 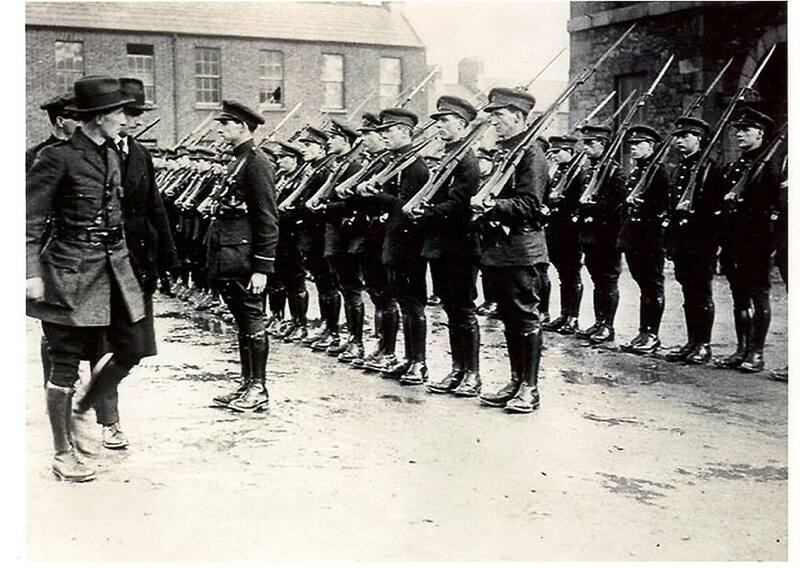 Its officers, ‘formed the cadre of the Dublin Guard’. After the onset of civil war, the Guard was rapidly expanded by the recruitment of many more men, including Irish veterans of the British Army. They have been described as “an eclectic mix of IRA veterans loyal to Collins and ex-Royal Dublin Fusiliers”. The Guard acted, particularly in County Kerry, which they occupied after a successful assault on Tralee in August 1922, with fearsome brutality, beginning the summary execution of captured IRA soldiers. The most notorious example of this occurred at Ballyseedy where nine IRA prisoners were tied to a landmine; the detonation killed eight and only left one, Stephen Fuller, who was blown clear by the blast to escape. In the autumn of 1923, the government started to reduce the size of the National Army to peacetime levels. This entailed a reduction of 30,000 personnel (including 2,200 officers) by March 1924. A small group of officers, led mainly by former members of the Squad, attempted to resist the efforts to demobilise. This situation evolved into what became called the “Army Mutiny”, which after an ultimatum, was resolved relatively peaceably with recognition of the authority of the Irish Free State’s Government. On 3 August 1923 the Irish Free State passed the Defence Forces (Temporary Provisions) Act, raising “an armed force to be called Óglaigh na hÉireann (hereinafter referred to as the Forces) consisting of such number of officers, non-commissioned officers, and men as may from time to time be provided by the Oireachtas.” “The Forces shall be established as from a date to be fixed by Proclamation of the Executive Council in the Iris Oifigiúil” The establishment of the Forces was on 1 October 1924.